Photos from this years event have been posted on the festival website here. Additional pics of the event by Maria Tuckler of snapd Beach can be found here. 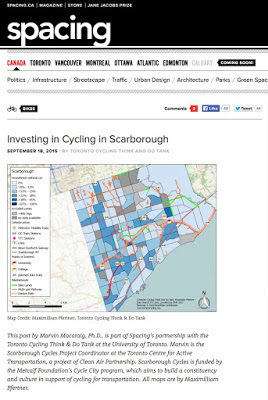 Ward 36 Cyclists member Marvin Macaraig authored an article in Spacing Magazine on cycling infrastructure investment in Scarborough. Click here for the full read. 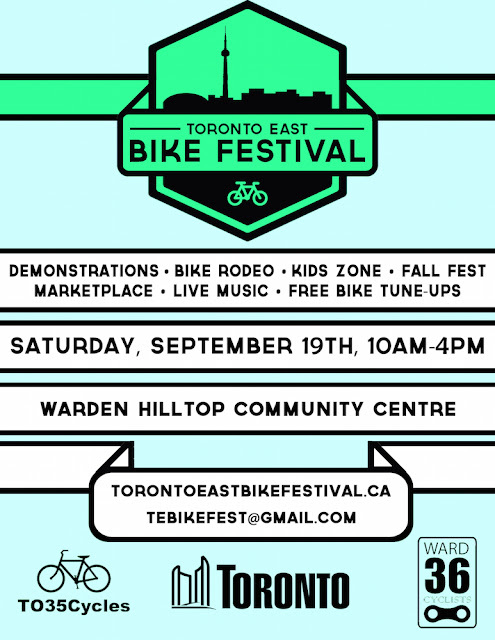 Toronto, September 4, 2015 - TO35Cycles, Ward 36 Cyclists, and the Crossroads of the Danforth BIA are pleased to present the Toronto East Bike Festival on Saturday, September 19, 10:00 a.m. to 4:00 p.m., at the Warden Hilltop Community Centre, 25 Mendelssohn St., Toronto. Billed as a ‘celebration of all things cycling', the event will showcase a variety of cycling and bicycle-related activities and demonstrations for all ages. “The goal of the festival is to expand the wide acceptance of cycling outside of the downtown core,” says Marvin Macaraig, Scarborough Cycles Project Coordinator for the Toronto Centre for Active Transportation (TCAT) and an organizer of the Festival. “We want to build a strong culture of cycling in Scarborough and East York, and showcase how cycling can be both a safe and fun way to enjoy the outdoors, and commute to work. We feel that when people see more cyclists on the road, the more likely they too will start riding or ride more often. The Festival was made possible by a grant from Game On Toronto, an initiative of this year’s Pan Am and Parapan Am Games Host City Program designed to promote participation in sports and foster healthier, more active communities. With a message that ‘big gestures’ are needed to expand cycling across the city, the Toronto East Bike Festival was one of 16 projects chosen from over 80 applications. 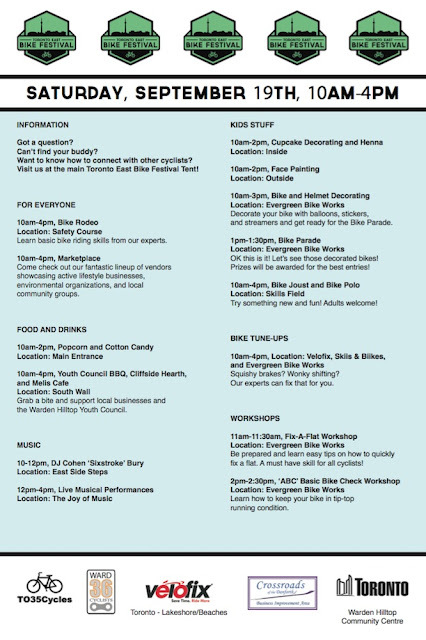 If all goes to plan, the Bike Festival will be the largest bicycle-related event ever held in Scarborough. 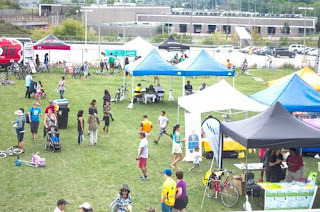 Planned Festival events and attractions include a Bike Rodeo, Kids Bike Zone, demonstration cycling sports, free bike tune-ups, and a diverse marketplace showcasing active lifestyle businesses, and local environmental/social community groups. 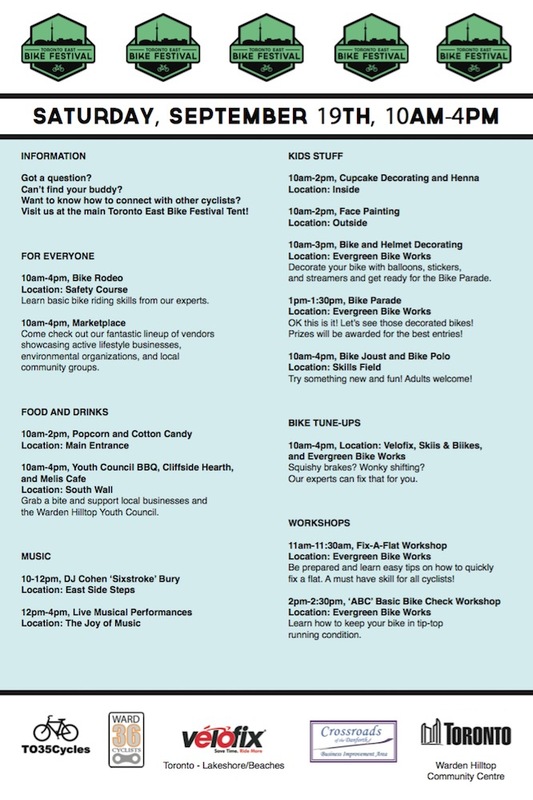 Organizations and vendors who have confirmed their participation in the Festival include, Evergreen Brick Works, Skiis & Biikes, Cycle Toronto, CultureLink, the Outdoor Club of East York, Scarborough Cycles, TCAT, the Custom Cycle Society of Canada, Tubes Cycle Shop, and Velofix. “We get more groups and organizations signing on every week”, says Macaraig. “Whether you ride all the time, or are just thinking about starting, there will be lots to see and do at the Festival. TO35Cycles is a group of volunteers all of whom have an interest in cycling. Their stated goal is to “promote and celebrate safe cycling in Ward 35 and across the City of Toronto”. There is no membership or other prerequisite to participate in the group and everyone is welcome to take part in the monthly meetings, held on the first Tuesday of every month, and any of the activities the group organizes. Established in 2013, Ward 36 Cyclists is volunteer-led community group based in Scarborough Southwest. Their goal is to promote safe cycling and to build/enhance bike culture in the community. Ward 36 Cyclists strives to build strong relationships and enhance the capacity of other community groups. The group also plans and organizes several family-friendly cycling events year-round. Established in 2008, the Crossroads of the Danforth BIA represents the area of Danforth Avenue from Victoria Park Avenue to Scotia Avenue.